A drawing of an ideal female head in profile, a copy of Michelangelo's original in the British Museum. William Gibson's inscriptions and characteristic price codes can be found on 51 drawings in the Royal Collection. Following Jonathan Richardson the Elder's explanation of Gibson's pricing system whereby the second figure is the unit, with 1 representing a shilling, 2 for half a crown (2 1/2 shillings), 3 for a crown (5 shillings) and 4 for a pound (20 shillings), this drawing, with the price code 2. 4. was priced at two pounds. William Gibson's attribution, Michol. Angollo Buonaroti, and price code 2.4 (the 2 changed from a 1) are inscribed on a strip of paper fixed to the recto of the sheet, demonstrating that Gibson believed the sheet to be by Michelangelo himself, and thus explaining the relatively high price of two pounds - double that of an autograph drawing by Michelangelo which was also previously in Gibson's collection (RCIN 912764). 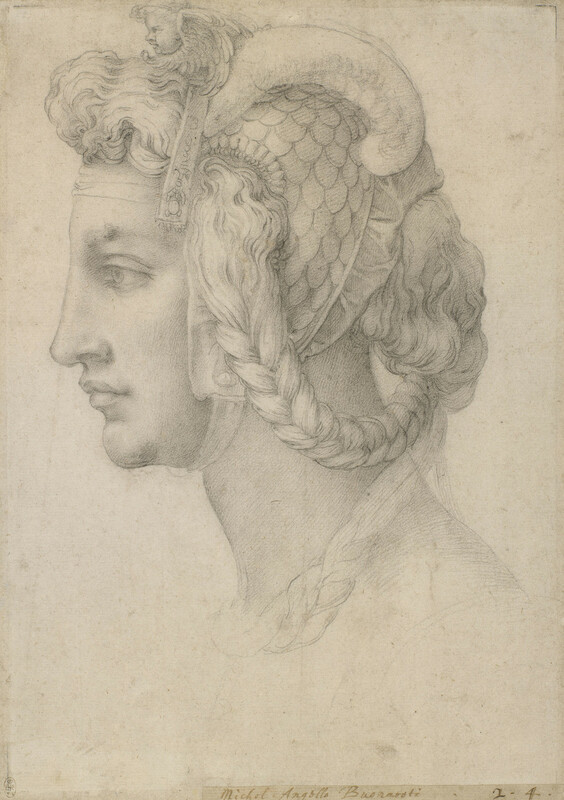 This drawing is a faithful copy - probably Florentine - after an original drawing of the early 1520s (British Museum), one of Michelangelo's teste divine or ideal heads, in which the artist explored archetypes of beauty. Few original drawings by Michelangelo had reached England by the seventeenth century, and it is thus not surprising that Gibson was not able to identify a high-quality copy such as this.